Purchase a new season ticket or half-season mini pack through The Citadel Club of Charleston and get concessions included! Each seat purchased will include a voucher for one hot dog, one Coke product bottle and one bag of chips for each game. That’s a value of $9.25 per seat/per game. A total of $55.50 per seat for the season! This offer is only available to new season ticket holders and must be purchased through The Citadel Club of Charleston between August 19 and August 26. Faculty/Staff Prices are available to current Citadel Faculty and Staff and members of their household. West Midfield Seats require membership in The Citadel Brigadier Foundation. See below for package/location minimum membership requirements. Can’t make it to all six home games? Try a 3-Game Mini Pack.The Citadel Blue Mini Pack includes Tickets to home games against Davidson on 9/5, Wofford on 10/10 (Parents’ Day) and Mercer on 10/31. The Big Red Mini Pack includes Tickets to home games against Western Carolina on 9/12, Charleston Southern on 9/26 and VMI on 11/7 (Homecoming). DON’T MISS OUT ON THIS SPECIAL OPPORTUNITY! PURCHASE YOUR SEASON TICKETS OR MINI PACKS BEFORE WEDNESDAY, AUGUST 26! 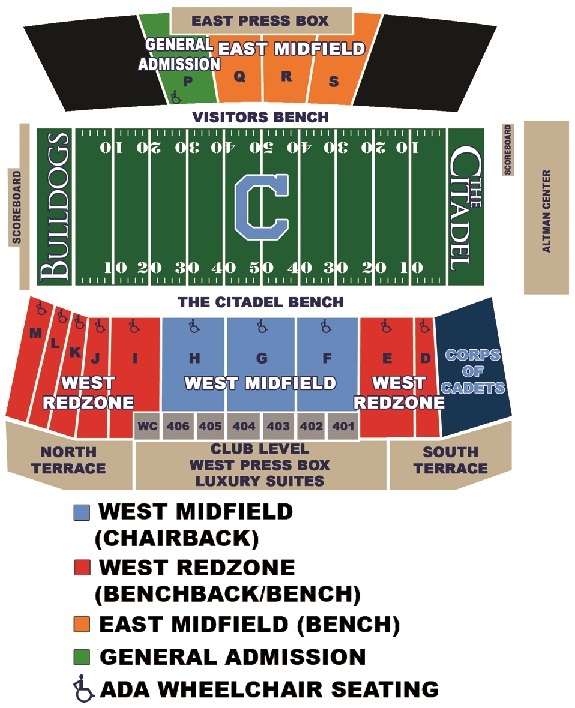 *West Midfield Seating requires a minimum membership in The Citadel Brigadier Foundation on for the 2015-16 School Year. 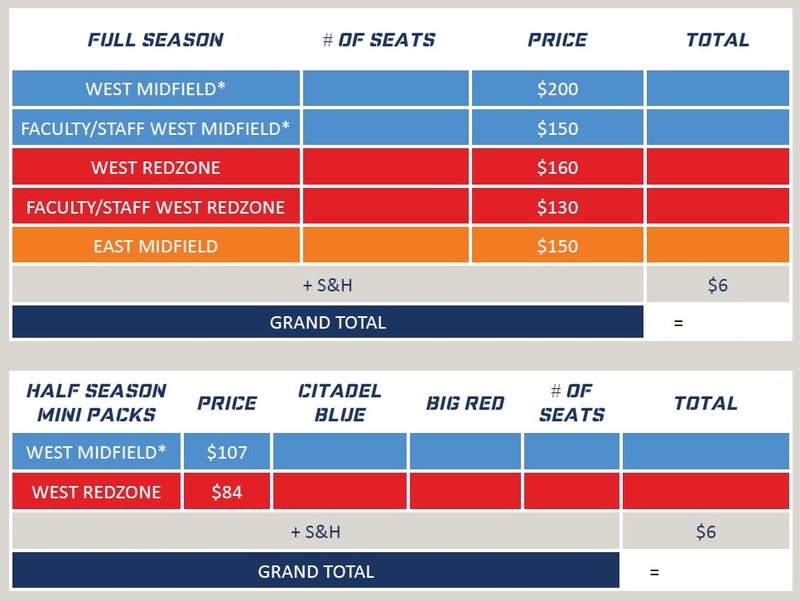 The Season Ticket Minimum for Section G is $600 per account. Minimum for Sections F and H is $300 per account. The Mini Pack Minimum for Section G is $300 per account. Minimum for Sections F and H is $150 per account.